Set just footsteps from the beach on the northern coast of the Aegean island of Kos, the Blue Lagoon Resort is a 5 star retreat with style. As enticing as its name suggests, the hotel has been designed to look like a small resort surrounded by 60,000 square meters of beautifully manicured gardens with a large lagoon-style pool twisting its way through the complex. It is located 1.5km from the nearest shopping center, 2km from the vibrant Kos Town and 22 km from the airport. The resort’s consists of one-storey main building, 6 two-storey annexes and 3 satellite buildings housing 662 spacious rooms offering something different for visitors to Kos. Each guestroom is appointed with a wide range of amenities, including modern furnishings, a/c, Satellite TV, telephone, Internet, safe deposit box, mini fridge, tea/coffee making facilities, hairdryer, bathrobe, slippers and balcony or terrace. The Blue Lagoon Resort operates on an All Inclusive basis featuring a selection of restaurants, bars and a daily animation program, providing lots of fun and entertainment for an unforgettable holiday experience. 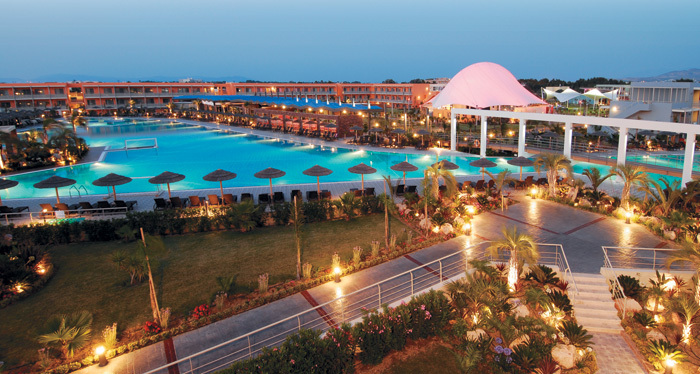 The hotel’s facilities include a large lagoon-style pool complete with whirlpool bath and water-jets, a water park with slides for adults and children, an indoor pool in the Spa, children’s pool and baby pool section, sun beds and parasols by the pool, sun terrace, 2 playgrounds, mini market, beauty salon, billiards, currency exchange service, table tennis and Wellness Spa with various treatments. There is plenty in the way of things to do. The more active types can make use of the 5x5 sized mini soccer pitch, while the Spa is the place for a laid-back and pampering experience. There are facilities for beach volleyball, basketball, a fully equipped gym, aerobics, floodlit tennis court, bicycle hire. There is daytime entertainment program for adults and shows several times a week, piano bar, live music several times a week, a la carte entertainment bar and a la carte sports bar. For the Lilliputian guests there is children’s entertainment from 4 to 12 yrs. The hotel's Conference Hall can accommodate all types of meetings from a small gathering to large banquets or cocktail events up to 670 persons. A team of well-trained professionals is on hand to offer suitable wedding packages and organize a seamless event for that special day.